A top Ukrainian official says Russia should provide U.S. investigators with access to former Ukrainian President Viktor Yanukovych, who fled to Russia after his rule was toppled in Ukraine's Maidan revolution of 2014. Dmitry Shymkiv, the deputy head of the administration of President Petro Poroshenko, said access to Yanukovych could prove vital to an understanding of the work done for Ukraine by indicted former Trump campaign chairman Paul Manafort. 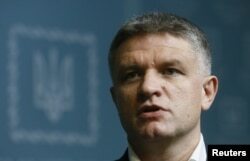 Shymkiv, whose role is similar to that of deputy chief of staff in the United States, spoke to VOA in response to comments made Tuesday by Russian Foreign Minister Sergei Lavrov, who said Washington should further investigate Ukrainian links to Manafort. Kyiv "has information" about the 2016 U.S. presidential election, Lavrov told a news briefing, according to reports by Russian news outlet RIA. 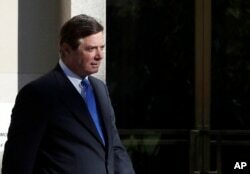 U.S. investigators probing Russian efforts to interfere in the 2016 U.S. election — which Moscow denies having made — charged Manafort and a business associate on Monday with conspiracy to launder money and other crimes. The charges, some going back more than a decade, center on Manafort's work in Ukraine, specifically for Yanukovych's pro-Russian Party of Regions. Yanukovych, who fled to Crimea just before it was annexed by Russian forces in February 2014, was not seen again until he held a news conference three weeks later in Rostov-on-Don, Russia. Ukrainian TV channel TSN has reported that Yanukovych lives in the Rostov region, although Russian officials have never confirmed this. "We need to understand ... how all of the [ties between Manafort and top Ukrainian officials] took place," said Shymkiv, secretary of the National Reform Council to the president of Ukraine and deputy head of Poroshenko's administration. FILE - Paul Manafort leaves U.S. District Court in Washington, Oct. 30, 2017. Russia, however, has not cooperated with a Ukrainian government arrest warrant for Yanukovych, who stands accused of the "mass murder of peaceful citizens" during the uprising against his administration. Similarly, Shymkiv suggested in a Skype interview with VOA's Ukrainian service, Russian officials would be unlikely to accommodate a U.S. request for Yanukovych to testify in the Manafort trial. "I believe Yanukovych should be interrogated by the U.S. government, but I don't think the Russians would let the Americans do that," he said, laughing. "But it is absolutely a valid claim, because Yanukovych was the leader of Ukraine's oligarchical structure, the leader of the corrupted vertical that was built in Ukraine since his rise to power in 2012 and up to the 2013 revolution of dignity." In his remarks Monday, Lavrov suggested that the charges over Manafort's work for Ukraine indicated that the U.S. investigators had so far been unable to make a case against Russia, which has been the main focus of the probe headed by special counsel Robert Mueller. "He has been working for several months. Accused two former Trump campaign managers of what they were doing on behalf of Yanukovych. Even though they were looking for a Russian trace," Lavrov said, according to the Russian news outlet Sputnik International. Lavrov also hinted at a Ukrainian role in last year's U.S. presidential election, saying Ukrainian officials "can say a lot about their position toward the candidates during the 2016 presidential campaign." Shymkiv said U.S. investigators should explore whether Manafort was connected to the confiscation of revenue from some Ukrainian businesses while he was serving as a consultant to Yanukovych's party. Dmitry Shymkiv, deputy head of the Ukrainian presidential administration, speaks during an interview in Kyiv, Oct. 31, 2017. Shymkiv says access to former Ukrainian President Viktor Yanukovych could prove vital to an understanding of the work done for Ukraine by indicted former Trump campaign chairman Paul Manafort. "There was very aggressive behavior toward Ukrainian business people, and there was a strong extraction of money from different industries, so [Yanukovych] should be interrogated in this case, or at least be a subject of the case, because Paul Manafort was hired by the Party of Regions, which represented Mr. Yanukovych," said Shymkiv. Asked for his reaction to the Manafort indictment, Shymkiv, who is tasked with overseeing post-Maidan reforms under Poroshenko's administration, said that while U.S. news coverage has been dominated by the money-laundering and tax-evasion charges, Ukrainians are focused on U.S.-based lobbying groups in the employ of various Ukrainian politicians. "[The Manafort trial] puts a significant light on a lot of lobbying activities in the U.S. from international governments or some political forces," he said. "We've seen many Ukrainian politicians hiring lobbyists for different activities — creating, for example, fake hearings in the Congress. "We appreciate American journalists who investigated it and showed how fake it is. But it is important that through the interrogation of Manafort by U.S. law enforcement agencies, we might get some additional insight into corruption practices, or other similar activities, which were happening in Ukraine during the Yanukovych regime," Shymkiv added. "This can help Ukrainian law enforcement agencies build stronger cases on convicting some Ukrainian individuals." Ukrainian prosecutors, he noted, are willing to remain in touch with U.S. Justice Department officials. "As this Manafort case evolves, there will be more stories and more disclosures taking place," he said. Manafort, who served as Trump's campaign manager for about two months in the summer of 2016, was forced to resign after reports surfaced about his financial relationship with Yanukovych.